In the beginning, the inspiration and actualization of the land-grant Industrial University, what was to become the University of Illinois, required thoughtful planning and a commitment to its built environment. The design and planning decisions made early on would influence all current and future development on the campus of the University of Illinois and its influence on the surrounding neighborhoods. It is the essence of the built environment that provides a back-drop to and anchors all aspects of daily life for most communities. For the Urbana campus these anchors are grounded in the foundations of historic landmarks such as the Central Quadrangle, the Alma Mater, Memorial Stadium, the Illini Union, Altgeld Hall, and Lincoln Hall. The daily life of those engaged in academic pursuits is punctuated by the open spaces and trees lining walkways between buildings. Within the buildings themselves, the use of space is in a never-ending state of movement, with remodeling projects shifting space to meet the classroom and laboratory needs of the next generation of students and faculty. The Illinois Built Environment collection provides to the public for the first time, a first-hand view of select original documents used to shape the Campus. 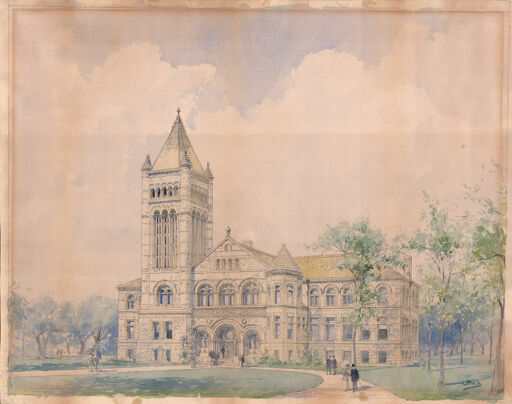 Among others, items include hand sketches of campus plans, original trace and linen drawings of many of the Central Quadrangle buildings, four separate proposed sketches for the original Library, now known as Altgeld Hall, and watercolor renderings for the display of the Alma Mater and many buildings. Many of the documents are common elevation architectural drawings. Some provide information that can inform the educated eye about building materials and the use of various construction techniques. Many are reflective of design trends of the times and some show comments and notes of the architect. Unique to a collection such is this is the dual role the document plays. At any moment a document may be in immediate need to help guide professional craftsmen with repair and remodeling tasks. This same document may simultaneously be a living testament to the past by the very nature of the information it contains, thereby making it a priceless artifact. This collection will grow over time as more original drawings, sketches and renderings are released for public use.